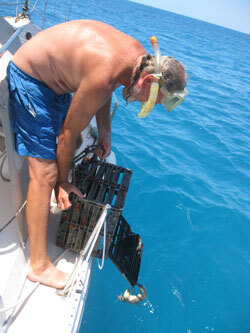 The crab pot was made out of an old milk crate. Here you can see the hole they climb into, but can not climb out of. Greg frees the line wrapped around Blue Wing's rudder and prop. It was looking like a leisurely day of sailing. 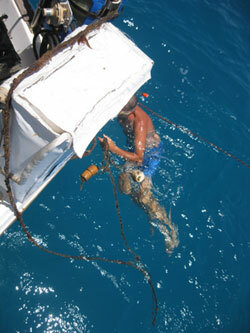 We had left Hatchet Bay and were heading down the coast of Eleuthera towards Governors Harbour. The wind was blowing 12 to 13 knots and we were on a close haul, tacking back and forth. It appeared as if it would be an uneventful day until Greg noticed we were trailing something. A ragged sea worn line extended back from Blue Wing. Greg snagged it with the boat hook and started to reel it in. Hand over hand he pulled hard until he finally hoisted it aboard. It was a crab pot. Not too long before we had noticed brown floats in the water tied to bits of line. Unaware that we needed to watch for such obstacles, we didnâ€™t start to see them until we were sailing past or were right on top of them. We ran over one and apparently it decided to join us for the ride. Once the pot was on board, we had to deal with the other end of the line attached to the floats, which was still under the boat. Greg tugged on the line trying to pull it up on deck. As he pulled it became harder for me to steer. The line was wrapped around the prop and rudder. He pulled harder and I couldnâ€™t turn the wheel at all. Must have been an exciting day for the crabs! First entrapment, next a ride down the coast and then freedom. With steerage lost, Blue Wing started to head up into the wind. The headsail back filled and Blue Wing heaved to, stopping her forward motion. We began to drift. This was a good thing. Greg was going to have to dive to free the crab pot line. He dove into the water. I stayed aboard and contemplated the fate of the crabs. We had dragged the pot a good ways. 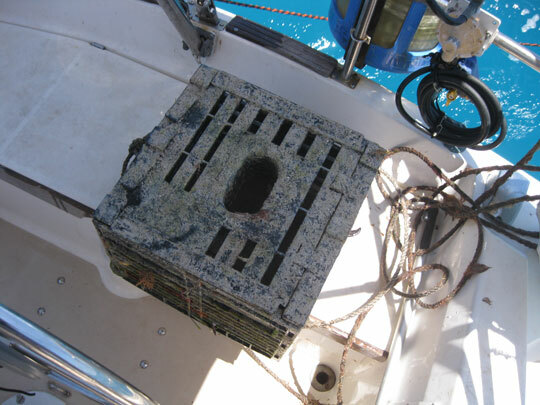 If the fishermen used any sort of system to keep track of their crab pots, they would not find this one. If we put the pot back in the water as it was, the crabs would die a slow death in their watery prison. When Greg emerged with the other end of the crab pot line, I suggested freeing the crabs before we disposed of the pot. Greg opened the case, protecting his valuable fingers as the crabs snapped at them, and sent them over the side back into their salty home before sending the pot back into the sea as well. We kept a keen eye out for more pots as we continued our journey. Sailing one and two miles out from the coast we traversed a minefield of pots almost all the way to the entrance of the harbor at Governors Harbor. that water looks soooo damn good,oh and the guy in the swim suit too!! !